You sit down to write a letter to your loved ones near and far about 2013. Your brain is either a logjam of stories to share…or it’s a total blank. In both cases, you turn to the only reasonable place for answers: the Internet. You get a little letter from someone you know well, and the person or family is barely recognizable amidst the trophies, accomplishments, travels, and sweet things little Junior said that were so funny. There is no mention in most Christmas letters of the challenges, the frustrations, the job loss, the worries, the miscarriage, the questions, the cancer scare, the doubts, the crap of life. Social media is a part of my job, and people are quick to remind me how people only put up the best parts of their life. It’s all polish. It’s edited. Yes, I nod. But paper letters (and even face-to-face conversations) are no different. We all want to be successful and to be happy. We put our best foot forward. I don’t think there’s anything wrong with that. Celebration is good. I think most of us need to offer others more opportunities to celebrate the good stuff of life. We have to be honest about the hard stuff in our Christmas letters. I’m not talking here about oversharing, airing in public that which is still a live issue needing intense personal work. No one wants or needs that. Deal with what needs to be dealt with. But let’s get real here—you want to really know what’s going on with people, even the crap. 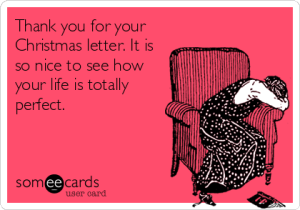 So write your Christmas letter accordingly. You can sensitively and beautifully share much more of your life than most of us do. You want people to celebrate with you. But you also want them to be with you in the struggle. The Bible has a word for this. When used collectively, it’s sharing the hard things so that others can weep and mourn and grieve with you. There are whole Psalms of intense lament, like Psalm 142. If we only shared a polished up life, we miss the opportunity to really know each other, to help carry one another’s burdens. And at Christmas time more than any other, this is appropriate. Scrape away Santa and Black Friday and you find the reason for this season, as it were: the incarnation, the “in-fleshing” of God, the coming of Jesus. He came into a dirty stable to save people from themselves, people who could not save themselves. Your family and friends will thank you for it. What do you think? Leave a comment below. And please share this with some friends if it was helpful. love this – i totally agree. thanks for pointing out our tendency to put our best foot forward is definitely not exclusive to social media. many of us even struggle with lamenting/vulnerability beyond written and digital forums.